Rainy May Sets Record for Soggy U.S. 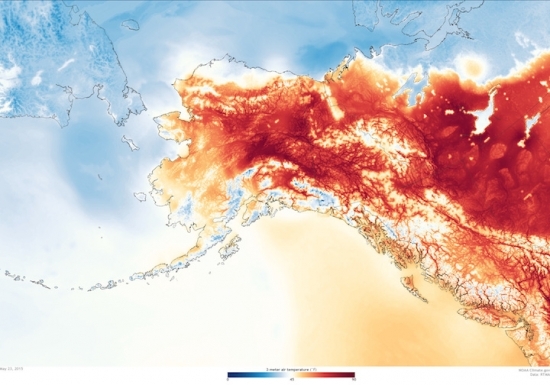 The numbers are in, and the month of May broke a number of records across the U.S. Alaska had its warmest May by a wide margin. California continued to see its warmest year-to-date. And thanks to staggering rains that swamped the Southern Plains, May was the wettest month on record for the contiguous U.S. 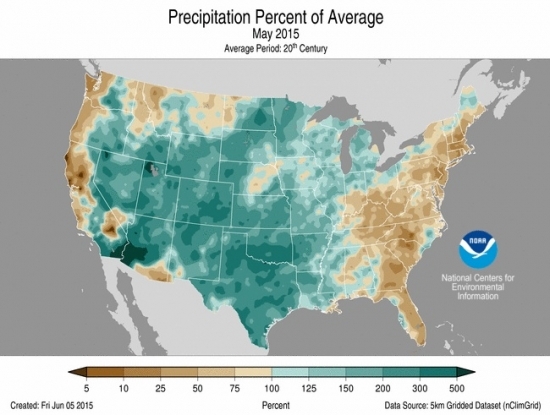 Percent of normal precipitation that fell across the U.S. in May 2015. Total precipitation for the Lower 48 in May was nearly 1.5 inches above normal, according to figures released Monday by the National Oceanic and Atmospheric Administration, boosting the month to the No. 1 spot in 121 years of record keeping. “It was quite a feat given a large portion of the East was drier than average and the drought continues in the West,” NOAA scientist Jake Crouch said in an email. Precipitation totals were higher than average across a large swath of the central U.S., with Colorado, Texas and Oklahoma recording their wettest May. Texas and Oklahoma also saw their wettest month, with totals more than twice the long-term average, according to NOAA. Many individual locations in Texas and Oklahoma also set monthly, daily and hourly records. Some places saw up to 500 percent of the rain they would normally get in May, which helped to wipe out the drought that had plagued the region for five years. The rains also brought their share of misery, though, as some fell in such quick and heavy bursts that flash flooding became a major concern and led to several deaths. Because of global warming, such heavy downpours are on the rise in the U.S.; a warmer atmosphere can hold more moisture, which gives rainstorms more fuel. A new Climate Central analysis shows that Texas has seen a 20 percent increase in the heaviest 1 percent of rainfall events in the past 65 years. Individual cities have seen even higher increases: McAllen, Texas, for example, has seen a 700 percent increase in such downpours and Houston a 167 percent uptick. On the other end of the rainfall spectrum, a lack of rain played a role in the considerable warmth that baked Alaska in May. Not only did Alaska see a statewide average temperature for the month that was 7.1°F above average, but it also got the earliest 90°F day in state history. Alaska has been under a ridge of high pressure that brought in a warm, southerly flow, Crouch said. Warm sea surface temperatures in the Gulf of Alaska have also helped keep temperatures across the state elevated. Temperatures across Alaska on May 23, 2015. The lack of rain helped jack temperatures up even more because of how parched soils are; wet ground can help to moderate temperatures as water absorbs heat energy. “Those dry soils have allowed daytime temperature to soar even higher under the ridge of high pressure,” Crouch said. In the far north of Alaska, on the shores of the Arctic Ocean, Barrow saw a temperature on May 21 of 47°F. That may not sound very warm to much of the country, but it is 18°F above average for that time in Barrow; normally temperatures don’t reach that high there until mid-June. California, meanwhile, is still in its warmest year on record to date, which is helping to exacerbate the historic drought that ushered in the first statewide water restrictions. The margin of the record has dropped, though, thanks to a cooler-than-average May, with the year-to-date 0.1°F ahead of the previous record warm January-May, which occurred just last year. This year continues to hang on to the record because of incredible warmth early in the year. Going forward through the summer, conditions in many of these record-setting areas don’t look likely to change. Both the West and Alaska have increased odds for more warm weather through the summer, and the Southern Plains has the possibility of more rains.